Security hologram stickers provide security, authentication and protection against counterfeit. Our manufacturing processes utilize 2D/3D security technologies to create a master hologram, thus making it virtually impossible for counterfeiters to create fake products or forge documents protected by holograms. Make personalized security hologram overlay for ID cards, Passports Certificates etc. Supplying optical security hologram overlay to more than 20 countries' governmental projects. Suzhou Image Laser Technology Co., Ltd is founded in 2001, have been focused on laser hologram optical anti-counterfeit area for decades, we own a lot of self research and developed micro structure optical mould producing techniques and equipments. As the security hologram supplier of 2008 Beijing Olympic Games, 2010 Guangzhou Asian Games, 2014 Inchon Asian Games, and security ID certificates design and service provider for both domestic and overseas. Nowadays, we consider "Science & Technology Lead to Environmental Protection, Security Packing Fashion" as our mission, thus do all our efforts to design and create the brand "No Ink Printing", aiming at realizing our commercial values by improving the environment of ink printing and packaging, protecting the brand and products, meet the requirements of consumers need for health and fashion. 1. What's your hologram sticker material? Usually we use PET material with 25 or 30 micron in thickness, other thickness like 15, 20, 50 micron are also available. 3. For Security Hologram, any shape, any color, you can do for me? Of course, we provide personalized hologram sticker. Round, Oval, Square, triangle, both are ok. Transparent, silver, gold, yellow, etc. 4. I need 3d hologram sticker, please give me your price indication. 5. Can you send me some hologram samples? Samples are available, we send it for free with freight collect. Kindly provide your express account or please pay the freight to us. We will arrange the samples ASAP. 6. Can I use your generic pattern with my printed logo? Yes, we can print your logo on background of our generic pattern, like GENUINE, SECURITY, etc. You also can add serial number, barcode, QR code, etc. 7. Why do you need authorization letter? 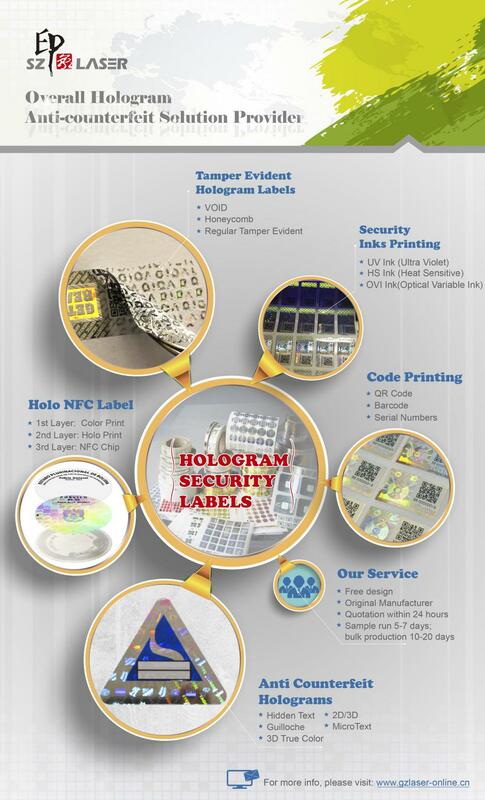 We're manufacturer of security hologram products. We need authorization to avoid copy and fake. Moreover, it can protect customer`s brand and products. If you want more details, please visit our website: http://gzlaser.en.alibaba.com/ or http://www.nip-optics.com/.